Officials at a Wisconsin software company say they’re “heartbroken” one of their employees shot four people in the office. Police say a Wisconsin software company employee had a semiautomatic pistol and plenty of ammunition when he opened fire at his office, seriously injuring several people before he was fatally shot by police. Police say they don’t know the motivation behind the Wednesday morning attack at WTS Paradigm in Middleton. Investigators haven’t released the suspect’s name but said he lived in nearby Madison. Middleton Police Chief Chuck Foulke says three victims suffered serious injuries, while a fourth person suffered a graze wound. Officials say the suspect in a Wisconsin workplace shooting has died after being shot by police. Middleton Police Chief Chuck Foulke says there are no other suspects in the attack that occurred Wednesday morning at software company WTS Paradigm. Foulke says the suspect died after being shot by officers. Foulke says three other people were seriously wounded during the attack. City Administrator Mike Davis initially said four people were injured during the shooting, but he and Foulke said the correct number is three, not including the suspect. Foulke says officers were alerted to an active shooter situation at about 10:25 a.m. He didn’t release details about the suspect or how the attack unfolded. He says officers are still interviewing witnesses. Middleton police dispatcher Danielle Kimball says officers are still finding people who’ve been hiding since the Wednesday morning shooting at software company WTS Paradigm. City Administrator Mike Davis says four people were wounded when the shooter opened fire around 10 a.m. Davis says the fifth person, believed to be the shooter, was also critically injured. Davis didn’t elaborate. Details about how the shooting unfolded haven’t been released. University Hospital in nearby Madison says it’s treating four patients from the shooting. Two were in serious condition and one was critical. The condition of the fourth patient wasn’t released. St. Mary’s Hospital says it’s treating another patient for injuries that aren’t life-threatening. The shooting occurred Wednesday morning in Middleton. City Administrator Mike Davis says the suspected shooter was also injured. Their conditions weren’t immediately known. A hospital spokeswoman says four people are being treated at University Hospital in Middleton. An employee at a Wisconsin business where a shooting took place says she ran for her life after hearing “really loud” shots. Judy Lahmers is a business analyst at WTS Paradigm in the Madison suburb of Middleton. She says she didn’t know whether to run or hide when she heard shots about 10 a.m. Wednesday. She says she ran out of the building and hid behind a car. Lahmers says she knows one co-worker was grazed by a shot but was OK. She didn’t know the extent of the shooting. Police haven’t released details but numerous ambulances are at the scene . Police and ambulances have converged on a commercial building where an active shooter has been reported in a suburb of Madison, Wisconsin. 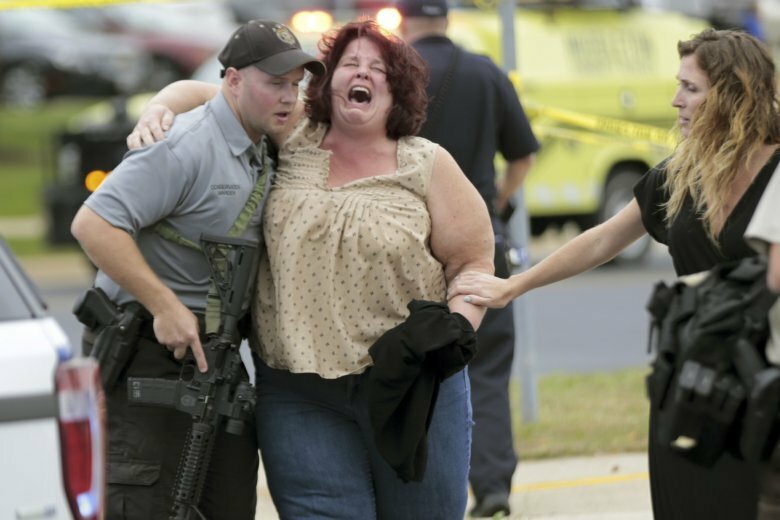 The Wisconsin State Journal reports the Dane County 911 communications center said the shooter was at an address Wednesday that includes companies Esker Software and WTS Paradigm. A State Journal reporter at the scene says at least 40 police squad cars and ambulances are outside the building. Police have set up a perimeter around the building. The Greenway Station shopping center next door to the office building is on lockdown. There are stores and restaurants affected. The State Journal reports that the Dane County dispatch center said shots have been fired at Esker Software in Middleton. Police and multiple ambulances have responded. Dane County Sheriff’s Department spokeswoman Elise Schaffer confirmed there is an “active shooter situation” and that the office is assisting Middleton Police with the response. She provided no additional information.